35mm color slides have been a world wide standard since WWII. “Gobo Slides” don’t exist except for people who re-purpose our normal slides by taking the film out and by cutting the film to fit their particular light. 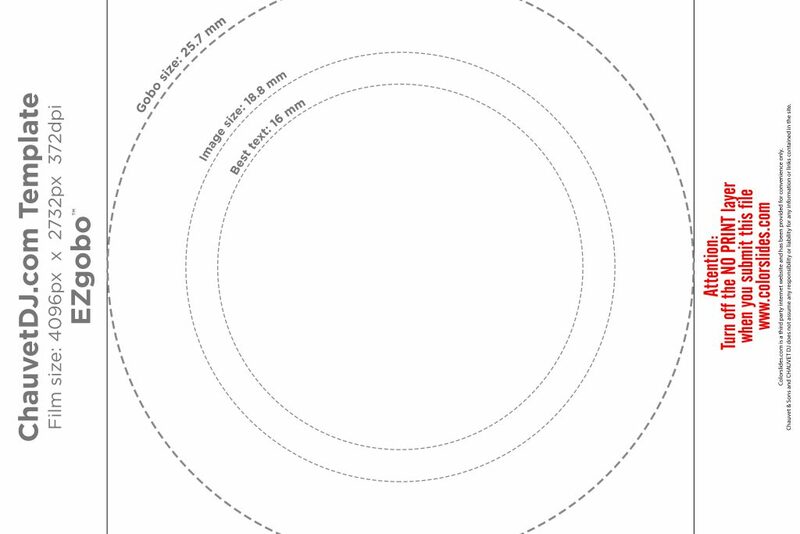 You would cut the film along the dotted line circle to fit your gobo. We don’t cut the film because we don’t know how the various lights hold the film and what size they should be. Small gobo projectors are a new, portable light projection product in the last several years. 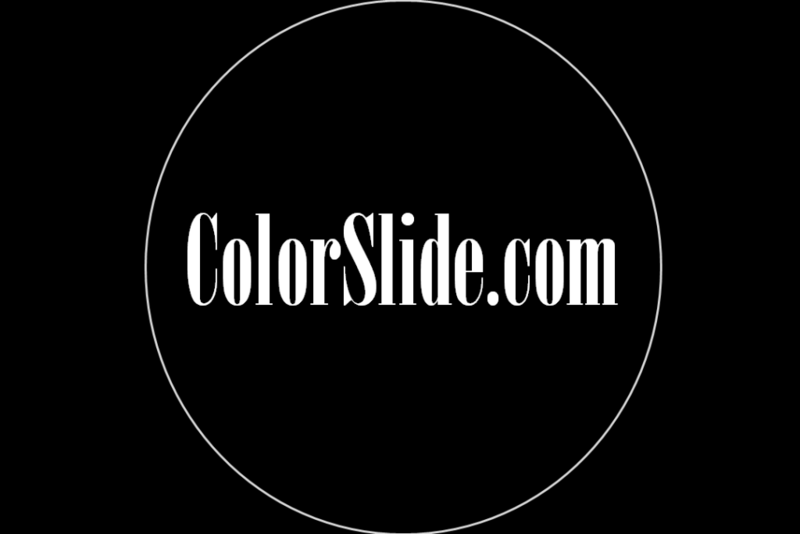 They’re used by DJs and other professionals at special events like weddings and corporate functions to project a logo or a message onto a wall, ceiling or even the floor. Our clients typically talk about the Gantom iQ and the Chauvet DJ EZ Gobo projectors. Please visit their websites for more information about their projectors. Please don’t send us the PSD files from the templates below. The layers hinder the printing process. Flatten the image and Save As a JPG file. For the Gantom iQ there’s a Photoshop template to use. The link on their webpage says Download Gobo Template. The template looks like the following image. Delete everything that you don’t need, flatten the layers down to the background and then save it as a maximum quality JPG file with no compression. You should end up with a black background and your logo in the center. Some people leave the square and the circle inside as a guide for cutting later. For the Chauvet DJ EZ Gobo there’s also a Photoshop template to use. The link is located on their website with the Download link. The EZ Gobo template is also on our website to download. Their template uses a white background, but you really need to change it to black like the image above. Black projects as no light on the screen. White is represented by clear film, which lets the full glare of the slide projector through. That makes your text and logo difficult to see. Be sure to delete all unnecessary layers, flatten the remaining layers and then do one final save as a maximum quality JPG file and send it to us. You should end up with a black rectangle and your logo or artwork in the center. This is the Easy Way below with PowerPoint! ColorSlide.com PowerPoint Template: For People that don’t have Photoshop. I’ve used PowerPoint for 25 years and it was designed for creating color slides. I’ve created a PowerPoint Template that you can use. Save it as the standard .PPTX file and send it to us. Here’s an image of what it looks like below. You want your images to look like mine above. You don’t need all of the text layers in the two templates above. Create a black page 4096 px wide by 2732 px high at 372 dots per inch (DPI). Create a 2 px thick line circle that fills the rectangle and center it. That circle will be 24mm in diameter on the finished color slide. 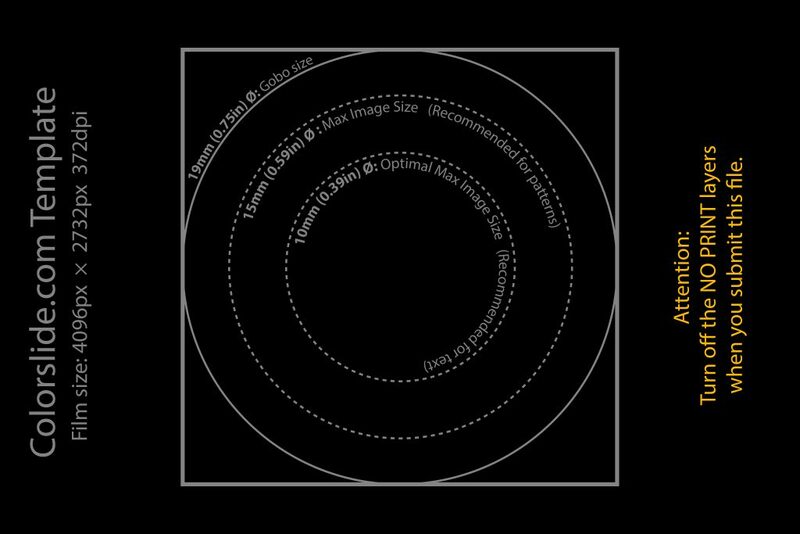 Put your logo or your artwork inside the circle and then experiment with larger or smaller to see what works best with your gobo projector. Save your image as a maximum quality JPG file with no compression.